Air Uganda introduced 'Crane Class' lounge. Air Uganda introduced ‘Crane Class’ lounge. Home>>Posts>>Air Uganda introduced ‘Crane Class’ lounge. It will therefore cater for high profile people from Uganda and the world at large. 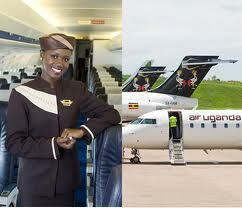 Sophiscated clients will now find reasons to fly with Uganda`s main airline. According to Lucy Ismail, Air Uganda`s Country Manager, Crane class has been modeled to accommodate high class clients who wish to fly in business class on normal passenger planes. She further said that the Crane class was modeled between business and economy classes as she was introducing their latest innovation of Air Uganda to its corporate customers. She affirmed that the Crane class has enough legroom, a beautiful lounge access and extra baggage capacity. Lucy noted that Air Uganda flies between Entebbe and Dar-es-Salaam’s but will soon add Kilimanjaro International Airport to its flying destinations. This will help Uganda tours/clients who after their Uganda safaris want to visit Kilimanjaro or vice versa. Ms Ismail noted that their logical next step for is to link up Arusha to East Africa and she announced that they have already began the planning process. Mr. Kiyingi Robert, who represented the Ugandan High Commission, called upon governments within the region where Air Uganda operates to lower taxes that contribute in high airfares limiting the number of customers. He observed that similar distances are charged more than double the prices in Europe due to government taxes. Mr Kayingi also said that strong regional airlines are an important ingridient to boost integration and the safari sector not only the Uganda safari sector but the entire region tourism. Emphasing the need for EAC member governments to work together, and speed up the integration process, while letting the private sector complement these efforts by providing an investment friendly environment. Kiyingi noted that Successful tourism in the region and the Uganda safari sector specifically, depends on strong efficient airlines these are what we need in the east African region. Air Uganda flies to Bujumbura, Nairobi, Kigali, Mombasa and Juba and was recently awarded an International Air Travel Association (IATA) Operational Safety Audit.